The first boat I ever built was called the Sairy Gamp. I had no idea at the time why it was called the Sairy Gamp or any of its history. I would learn that later on. I happened to build Sairy quite by accident. We had moved from Northern New Jersey to Sudbury, Mass. That brought me closer to my Uncle Don who was living in Peterborough, NH, Soon after we moved to Mass I decided to pay a visit to Uncle Don. Uncle Don was a family physician but I saw him more as a Renaissance man. He delved into all sorts of endeavors such as competitive pistol shooting and photography. When he took up one of these activities it was never half-hearted. He won awards for his photography and went to national pistol shooting events where he won prizes for his marksmanship. So when I came to see him in Peterborough I didn’t know quite what to expect. I hadn’t seen him in quite awhile. It wasn’t long before I was intrigued with what he was up to. First, he showed me his sugar shack where he boiled down his own tree sap to make maple syrup. We went inside to his workshop where I spied a row of various sized rounded boards attached in a row to what looked like a very sturdy work bench. “What is that?” I exclaimed. He said he was building the Sairy Gamp, a small wooden canoe. There was little further discussion and we moved on to other things. I returned about six months later and inquired about the canoe he was building. 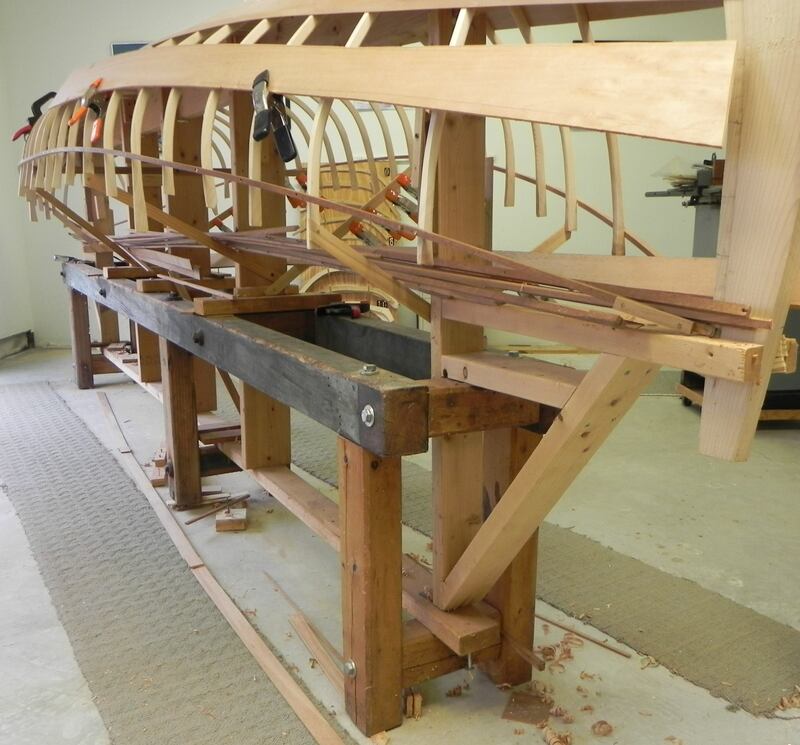 He said “Oh, I haven’t done anything more on it, would you like to build it?” “Sure,” I said whereupon he gave me a single sheet of paper with the plans for the boat, the molds for building it, the strong back, or boat builders work bench, and enough Atlantic white cedar to build it. 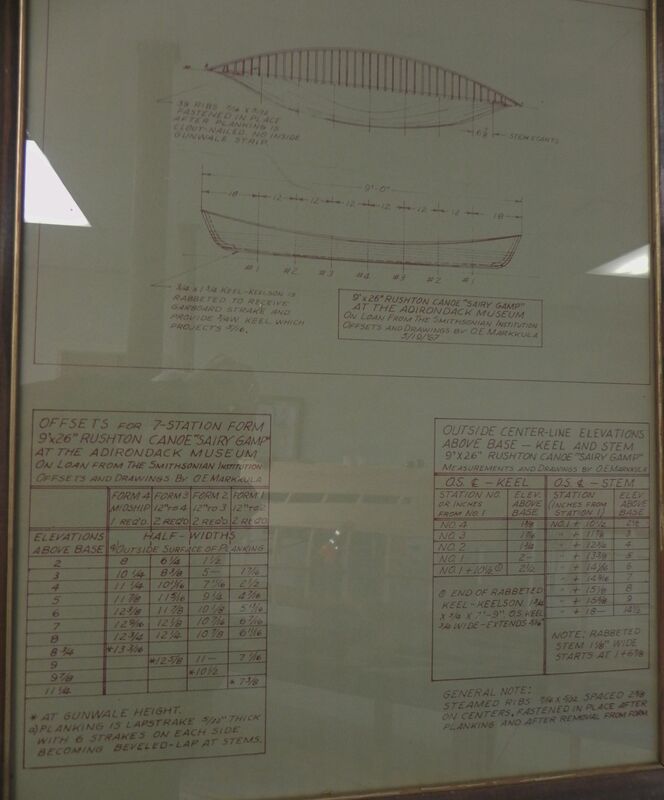 The sheet with the bare bones instructions for building the boat is shown below. Sheet of instructions for building the Sairy Gamp. The work bench, or strong back, was a massive affair. Uncle Don said that he had seen it in the cellar of a local burned out mill. He somehow found someone he could ask for permission to take it. They said he could have it if he could haul it away. Here it is below. It has served well in building well over a dozen wooden boats. Uncle Don’s strong back supporting an Adirondack guideboat under construction. With the help of my son Stew we built the Sairy Gamp. The boat is really quite small, only nine feet long. I thought it would be a great little pack canoe for the Adirondacks. I couldn’t wait to try it out. One May day I decided to take it out on its maiden voyage. The marsh adjacent to our Long Lake home was flooded from the spring runoff so it was a perfect spot for a trial spin. Besides my wife Fran could watch from inside our home. When I got into Sairy I was startled to see that the water rose right to the gunnels. I gingerly paddled away expecting at any moment to be swamped. Unknown to me, Fran was doubled over with laughter. She said that I looked like I was paddling about in a saucer. Something was definitely wrong. Some inquiry revealed that Sairy had been built for a man who weighed around 110 lbs. whereas I weighed in excess of 170 lbs. What to do with my first boat? I couldn’t use it with any assurance that I would say afloat. 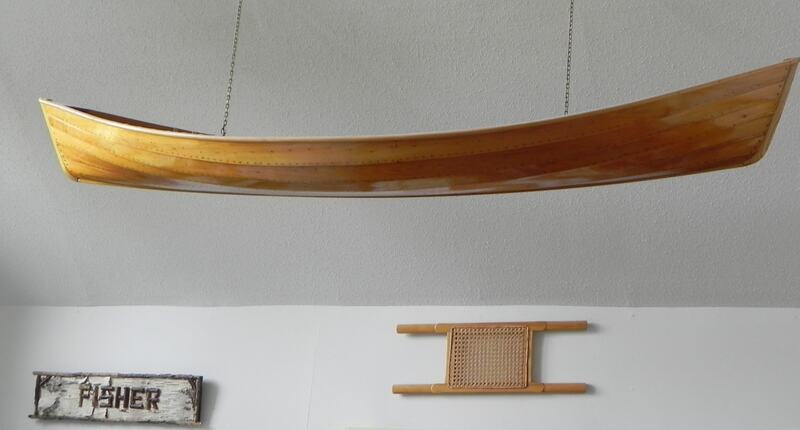 It was decided that it would occupy a place of honor by hanging it from the cathedral ceiling in our Long Lake home. Here she is. Another view of my Sairy Gamp. The real Sairy is on loan from the Smithsonian Institution to the Adirondack Museum, When you visit the Museum during the summer look her up. She has a marvelous history which I will relate to you in the next post.